As you probably know, I'm an owner/operator of a two-year-old human being. Having one of these has made me appreciate all manner of larval people. They're generally a pretty fun, energetic, earnest group, even if their decision-making skills are pretty lacking and they're more willing to shove things in their mouths than society normally tolerates. Last night my 4-year-old Jalop of a nephew Eli and I had a serious conversation about the car he wants to build. I know there are a lot of talented artists out there in the Jalopnik commentariat, and I would like to ask them all if they would consider drawing up their "Artist's Conception" of the car according to the carefully considered specifications he came up with. I would just love to give him a tangible expression of what his awesome imagination came up with. If anyone is particularly ambitious, I have access to a 3D printer so if someone puts together a solid .stl I could even print it for him (and a copy for whoever puts it together). - It is powered by 19 Porsche engines, each producing 459 horsepower. I think they will need to be water-cooled turbocharged boxer 6s. This was entirely his own idea, but I commended his choice of using boxer engines for a multi-engine setup since they will stack so well. - The engines are all linked to a single transmission. He didn't specify, but I think viscous couplings for the inputs would probably be a good idea. - There are seats and three steering wheels, and all three can drive the car at the same time. 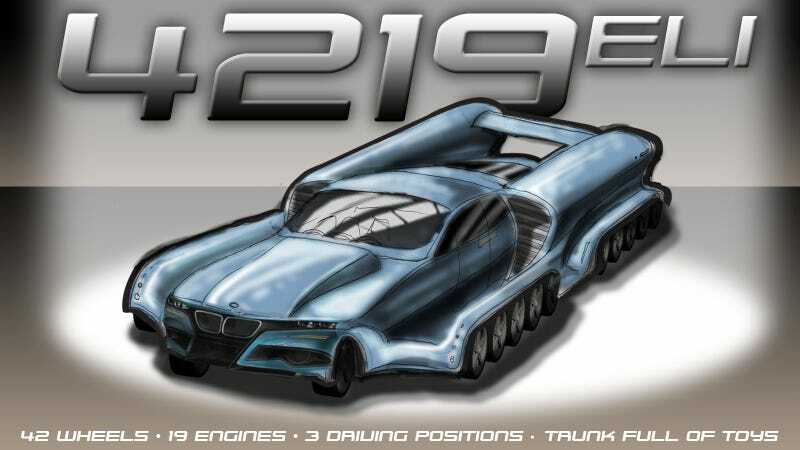 The model name that I came up with is "4219ELi" - 42 wheels, 19 engines, an Extra Long wheelbase, and fuel injection. That's a pretty tall order, but also a pretty sweet car. 8721 combined HP, 42 wheel drive? BMW branded, but with Porsche engines? Toys in the trunk? It's perfect. I know there are many, many talented Jalops out there who can do a better job than what I threw together, and I'd love to see them. Let's see how many versions of Eli's car we can make for Eli. I encourage anyone to give it a go — even if it's just a quick sketch. Sure, some people may make full 3D renders, and that's great, but I think anyone can have a good idea. Here's how I approached it. I divided the flat-six engines into three main banks: one of nine, forming the spine of the car, mounted low, to keep the center of gravity low (I'm connecting the engines by their cranks) and then two side pods of five engines each. A Y-shaped transmission unit would be mounted at the rear to combine all the engine power to send to all 42 wheels. cooling radiators are in the large ducted areas on either side of the car. The 42 wheels are divided into four 40-wheel units, and two steering wheels up front. For, you know, handling. I think this car would likely demand at least two lanes or so on a road, so be advised. Luckily, the din of 19 flat-sixes should be enough to make everyone clear out. And that trunk you can play in — mine uses airplane tech to have an inflatable slide when you open it! So, let's see your ideas! Here you go, Eli!